Diwali is just less than a month away. It’s the time of the year when everyone is gearing up to celebrate this glittering festival of lights in the grandest way possible. This Diwali just got brighter, with a new and cracking rummy tournament from DeccanRummy.com, open to rummy players across India. Alternatively, players can also buy the tourney ticket for Rs. 500 and avoid the above-mentioned steps. “We are constantly looking at ways to spice up all the regional festivals in India with our special tourneys. 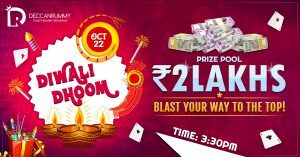 Diwali being the grandest Indian festival warranted an exciting tournament with massive prize pool, so we came up with this Mega Diwali Dhoom tourney to add more brightness to this already luminous festival. We hope our users will turn out in huge numbers and make this tournament a roaring success” says Thamarai Kannan, Head of Operations at DeccanRummy.com. The countdown to the carnival has just begun, just create an account with DeccanRummy.com and follow the above steps, to join the fun. Rummy Online industry is on a boom in India. Rummy game is a unique blend of fun and thrill. Perhaps, this is the reason why the game has such a huge following among the younger generation of India. Card games have a long history in India. It’s isn’t uncommon to see the game played within family circle during festivals. With the advent of online rummy, card game enthusiasts no longer have to prowl for compatriots for a good game of rummy. One of the most exciting benefits in online rummy is the tournaments that come with a big prize pool. Millions of players have pocketed astounding levels of prize money all the while playing rummy tourneys. If you’re a rummy enthusiast reading this, brush your skills and gear up for a blazing action. DeccanRummy.com has informed that multiple players can win cash prizes in this tournament. With so much available to take, a try is a must for both, novice and experts. So, go ahead and give your best! Newbies will need a DeccanRummy account to join this tournament. Register for free and get one now! 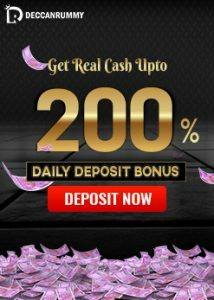 DeccanRummy.com is the home to more than 2, 00,000 rummy players across India. DeccanRummy.com operates within the boundaries of law and conventions set by the Government of India. 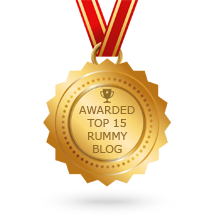 Rummy enthusiasts across India can join the website for free and play 13 card Rummy games for FREE and cash. DeccanRummy.com’s games can be accessed online or through mobiles or by downloading their desktop software. Offering prizes more than Rs. 10, 00,000 in the form of monthly prizes, the site sees huge of number of players joining every day. 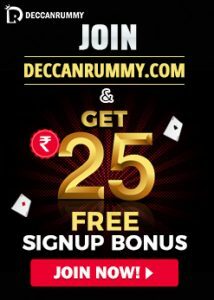 DeccanRummy is certified by Infysec for fair play and offers a wide range of free roll and cash rummy tournaments for all the rummy players in India. The only pre-requisite to play rummy game at DeccanRummy.com is a stable internet connection & some rummy skills. So keep honing your rummy skills to earn riches. Navratri Special Tournaments A Shoutout!